Want to explore the little-known neighborhoods of Chicago? Own a home in one of Chicago's hidden-gem neighborhoods? There is a growing trend of short-term renters and travelers in Chicago. According to Airbnb, in 2016 there were 300,000 travelers in 2016. 500,000 in 2017. Wow. That is growth. It is creating a new culture along with it, too. The lesser known neighborhoods, and their businesses, now benefit in unexpected ways. Airbnb gives property owners with extra space to rent a platform to connect with travelers. Through the Airbnb platform, owners and investors in Chicago can list their property with images, amenities, and details for their ideal guests. Chicago travelers look through the listings, and when a user finds the right place to rent, they can simply (and safely) book and pay. The Airbnb platform makes it simple to rent out your garden unit or coach house or guest suite or any space that you only use occasionally. Some Airbnb options fulfill your basic needs. You get a place to sleep, a kitchen, a bathroom — just the basics. Others go way beyond average with creative decorating themes, unique buildings and designer touches. While some people go for affordability, many want the experience of staying somewhere unique. The city has many of those standout options that solve the dilemma of where to stay in Chicago. 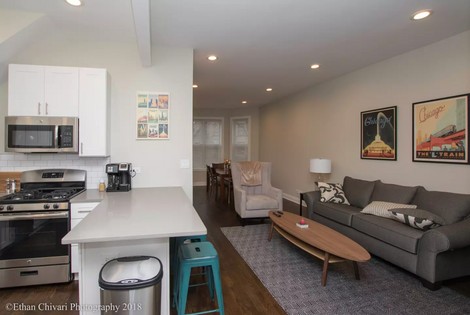 Nestled in Southport Corridor, a short walk to Wrigleyfield, this duplex features two floors of newly renovated finishes. Equipped with 4 beds and room to sleep up to 10, you can find this home on a quiet one-way street only one block away from the Brown "L" stop. Enjoy the fully-equipped kitchen and bathrooms before heading out to a Cubs game! You even get a personal parking spot in a gated area. Bucktown is one of the sought after neighborhoods for families and young professionals. It has some of the best food, coffee, and cocktail joints in the city. This home is all custom-made. It even has heated floors in the basement! From the outside, you see a quaint garden in the front and when you enter you can see that everything has been meticulously detailed. The architecture and detailing leave you in awe over this Bucktown home. The outdoor area is fully stocked with a grilling area, garden, sound system, and a nice little yard. This home is great for business traveling groups and families! The apartment is located in River North in Downtown, Chicago. It is in the Near North Side district, and as seen on the map below, in the River North area. There is a very prestigious high school (Walter Payton College Prep) closeby, town homes with young families and popular cafes and restaurants (Big and Little's) in the neighborhood. It's the place to be! Formerly home to many factories, it's modern mix of high-rises and historical buildings adds to the neighborhood's eccentric feel. You can find some of the most popular restaurants, dive bars, lounges (nightclubs), jazz clubs and art galleries here. The area is ideal for a traveller. The apartment is near all major shopping and nightlife streets, while also being walking distance from Lake Michigan. Airbnb’s impact in Chicago is a top of debate among property owners, city government leaders and community members. The news in the beginning of 2018 says that Airbnb raised $2.9 million for homeless services. Some argue that Airbnb rentals hurt the market. They say that short-term rentals take away the option for longer term renters to claim space, leaving fewer rental options and driving up the prices. They also say that it takes away from the sense of community. For these reasons, Chicago has put in regulations with the goal of keeping the sense of community and not driving up prices. Proponents for Airbnb in Chicago know that the guests bring money into the Chicago communities where they are located. A visitor who might normally choose a hotel in the heart of Downtown Chicago instead chooses a unique rental in a lesser-known neighborhood. The restaurants, boutiques and other businesses in that area earn increased revenue as more guests stay in the area. For Chicago property owners and investors, the home-sharing market offers a major benefit. In 2017, according to data from Zillow and Airdna, Short-term rentals on average made 40.1% more money than longer-term rentals. Airbnb investment properties give owners a major source of income to offset the cost of the mortgage. For homeowners who rent a room or the whole unit, home sharing is a way to supplement income or help pay for the home. For business owners with investment properties, it maximizes profits. While guests seem to want a more local experience through Airbnb, the growth has caused many cities to implement regulations. Another component is the Prohibited Housing List. Essentially, the owner of a building can place units on the list, meaning those spaces are ineligible for renting on Airbnb. As of 2018, about 91,000 apartment and condo units are on the list. That may sound like a lot of units, but it’s only about 7.6 percent of all Chicago housing units, so there are plenty of properties not on the list. The list of properties on the list is concentrated highly in the downtown area, especially for big condo buildings, although there are properties throughout the city that don’t allow home sharing. Always check before purchasing a property as a rental. No matter how tempting it is to rent out a unit for profit, ignoring the rules can result in fines of $1500-5000. Do you have the capital to invest or secure a loan for the property? Can you cover the payments if you aren't able to rent out the place regularly? Are you prepared for the possibility of damage to the property? Do you want to manage all of the guests and increased turnover by yourself or with a management firm? Do you know the latest regulations for Chicago Airbnb properties? Do you have time to manage needy guests and bookings? How much more income can you make, and is it worth it? Will you handle cleaning, check-in and check-out, customer service and other issues yourself? If not, can you still make a profit when you hire someone to handle the work? Proximity to the downtown is the name of the game. Imagine you are at traveler who has never been Chicago - you don't know about the neighborhoods or local tastes. Airbnb guests in Chicago want proxmity and safety! Look at the location from a traveler's perspective. They want neighborhoods that are safe, close to amenities and give them easy access to other parts of the city. Distance to public transportation is not as important as you think. While it helps for business travelers, it is not as big of an issue because Chicago has Uber/Lyft. That said, public transportation helps because renters want access any attraction in the city. Investing in a property with a prime Chicago location increases your chances of filling up your calendar with rentals. Regulations in Chicago can change at any time. Make sure a potential investment property meets current Airbnb regulations set by the City of Chicago. Ensure the property isn’t on the Prohibited Housing List. Verify that the building association or homeowners’ association doesn’t have restrictions in place on home sharing. What amenities does the property offer, or can you offer? Does it have outdoor space, a patio, a hot tub, a pool table, great views or a gourmet kitchen? What about parking? Those extra touches make your Chicago Airbnb more appealing to Airbnb guests who want a unique, homey experience. This is a sleeper. The size of the unit is an important factor because the bigger the unit, the more people you can sleep. The more people you can sleep, the more money you can potentially make (as long as it is compliant with Chicago's fire code!). Some Airbnb guests want to accommodate a whole family. Others use Airbnb to find even larger spaces for reunions, retreats or other large-group travel. Chicago homes with classic character and unique style often gain attention on Airbnb because pictures are one of the most important parts of your listing. You don’t need to buy an old church to have a popular rental option. You might choose a modern-style loft space or a vintage apartment with exposed brick walls. From long-term to short-term rentals? If you’re a property owner in Chicago, upgrading your home with Airbnb travelers in mind can be a ticket to making more profits with Airbnb. Simple cosmetic updates or renovations can make your Airbnb more appealing. Simple additions to your home make for great guests stays. Think of the things we take for granted at home, sometimes. Maybe a rain showerhead or free Wi-Fi and free parking? A fireplace? Coffeemaker? Any outdoor space from a balcony to a backyard is a value-add to be included in pictures and to be upgraded for a great guest experience. Add seating if the space allows. Other options to upgrade outdoor spaces include plants, BBQs, hot tubs, and gardens. You don't need to do a full renovation, but guests want to stay somewhere nice and clean. Take time to upgrade the kitchen, common areas, and any part of the property that guests may become attune to. You'd be amazed what some art and knick-knacks can do for your place and for the photos. Add some decorative touches to give it a distinct theme. If your space is an industrial-loft, play up the contemporary industrial vibe in your color choices, furniture and decorations. How can you make your airbnb homey and have your guests feel like they are home away from home? Adding little accents that make it feel more like home help a lot! Hang artwork on the wall, places flowers in a vase and display coffee table books in the living room. Simple touches make a big impact. One way to identify upgrades you need to make is to spend the night in your own rental from the perspective of an Airbnb traveler coming to Chicago. If you were to rent that space for a vacation, what would you like? What would you dislike? What would you change? What do you think of our guide to the growing Airbnb market in Chicago? It seems to continue to grow so don't get in too late!